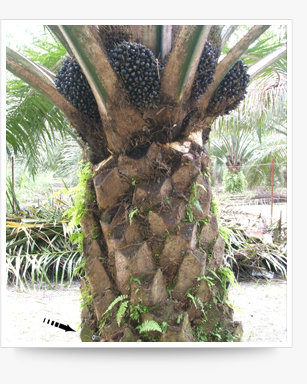 Taking advantage of oil palm being a monocotyledonous species, food (phloem) and water (xylem) vessel are scattered all over the trunk in a vascular bundle, TIS deploys its nutrients all over the vascular bundle. At any height or level, nutrients can leave the xylem and pass laterally to supply nutrients to all needy areas (sink area). By employing Stekken TIS, immediate correction can be accomplished to rectify insufficient nutrients in oil palms caused by extreme weather and soil conditions. Managing oil palm nutrients via Stekken TIS ensures a complete macro and micro nutrients and it is make available at all times. This in turn resulting a higher and stable yield all year round. Trunk injection consists of two main components in its system; the food (crystalline fertilizers) and the transporter (transport and distribute nutrients).